What does this mean for the market? First of all, watch for the resale values of the old Nikon 50mm designs to plummet – it’s been clear for awhile that Nikon is shifting away from and will eventually abandon their screw-driven lenses, and it appears that they’re finally getting a move on it (now let’s have an affordable sub-$100 50mm f/1.8, shall we?). 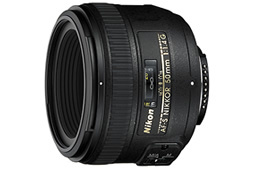 This also snatches away a significant profit opportunity for Sigma, who only a few months ago introduced its own 50mm f/1.4 and had the opportunity to seize this market segment as the only maker of a fast-focusing, large aperture midrange prime for the Nikon mount. The last thing I have to say about this – manufacturers, please jump onto the IS bandwagon already. The first of Canon or Nikon that starts pumping out 50 f/1.4 IS or 24-70 f/2.8 VR lenses is going to make me hop ship (or stay aboard) instantly. Olympus/Panasonic made quite a splash last month with its announcement of the Micro Four Thirds system. The original Four Thirds system, which is used by Olympus and Panasonic cameras today, was set up as the first (and to this date only mainstream) mount system built from the ground up for digital SLRs. The concept behind the system was that by using a smaller sensor (roughly a quarter the area of a 35mm film/digital sensor) and freeing itself from the limitations of backwards-compatability with legacy lenses (an issue that Nikon has had to deal with, in particular), the Four Thirds system could leverage the image quality of larger sensor cameras while condensing the size of their camera systems to make them much lighter and more compact than other camera systems. While Four Thirds cameras have been somewhat smaller than their APS-C or full-frame counterparts, the size and weight reductions were never as dramatic as hoped. 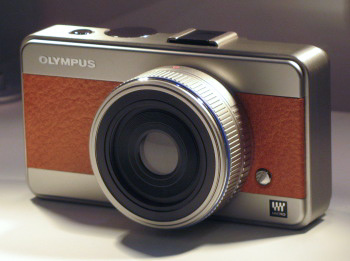 Part of this was due to the Olympus and Panasonic business strategies, which quickly dumped the unique original designs of cameras such as the Olympus E-330 and Panasonic L1 in favor of more mainstreamed body and lens designs that were beefed up. The larger issue was that, despite being built from the ground-up as digital systems, Four Thirds still held over many mainstays from the film era, most notably a mirror assembly box to provide a view through the viewfinder. The newly announced Micro Four Thirds system seeks to finally achieve what the original Four Thirds system promised to be, by eschewing the mirror assembly entirely and using live view exclusively for providing an image preview (through the rear LCD or an EVF). What this basically gives is a camera very similar to the non-SLRs available today, but with far larger sensors and interchangeable lenses. The mockup Olympus presented here is just that, but it gives a sense of scale for how much the system can be downsized in comparison to today’s “full size” SLRs. The body here is listed as 120x65x32mm (4.7×2.6×1.3 inch), which is a fair bit smaller than most “compact” cameras are even (though those specs don’t include the size of the lens, which is surely going to increase thickness by a large amount). Following the introduction of the M8, Leica continues forging ahead into the world of digital with its new S2 and S digital SLR system. This isn’ Leica’s first digital SLR – the company did introduce an S1 back in 1998, but it’s design was a bit more…. outside of the mainstream. Leica is claiming “twice as fast performance as Hasselblad H-series” cameras, and improved high-ISO performance. Perhaps most surprisingly of all, unlike it’s autofocus-less M-series rangefinders, the S2 does autofocus, and what’s more Leica is also introducing 9 autofocus lenses as well. How will it actually stack up to the Hassys and Mamiya’s and phantom Pentax’s of the world, not to mention the Canon (and possibly Nikon, soon?) 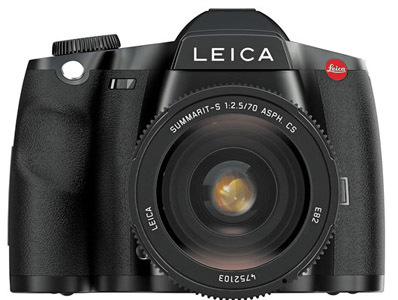 ultra high-res 35mm SLRs that Leica is angling to compare itself to? Just by the looks of it, it should handle much more conveniently (its ergonomics are much more like a 35mm SLR than a clunky digital MF box), but don’t expect performance (especially in the AF or high-ISO departments) to come anywhere close to the versatility that the 35mm (or even APS-C) SLRs provide. As for the cost? Well, it’s a Leica. With a 30x45mm sensor. And medium format glass. So I’d start in the range of a half a milion. 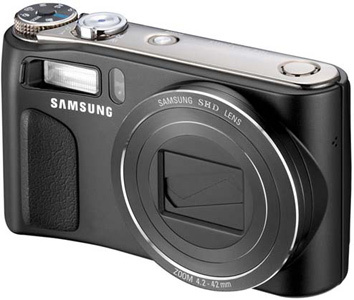 To date, Samsung’s entry into the digital camera market has been feeble, at best. While the company’s a beast in the semiconductor industry, to date the image sensors it’s produced for its cameras have been disappointing to say the least – high noise combined with heavy-handed noise reduction processing that renders some of the worst quality images among the major players. The sensor issues won’t really be revealed until some hard reviews come in (which won’t happen until review sites start showing some love for Samsung, which really requires them to come out with flashy high-end products, like Nikon does despite their long track record of horrendously vanilla non-SLRs), but the newest HZ1 stirs up the pot with some interesting features, most notably a 24-240mm (10x) lens in a small 1.4 inch body, placing it directly competition with Panasonic’s long running and highly succesful TZ-series of compacts. Panasonic had long been the most versatile compact ultrazoom camera, and until now was still the only one to feature a highly useful 28mm wide-angle lens. With the only other competitors (Sony H10 and Canon SX110) pushing out boring lenses in the 36-360mm or so range, consumers will finally have some choices if they’re looking for a versatile compact ultrazoom with wide-angle capabilities. Samsung is still a relatively newcomer (heh, remember the days when we used to say that about Panasonic?) 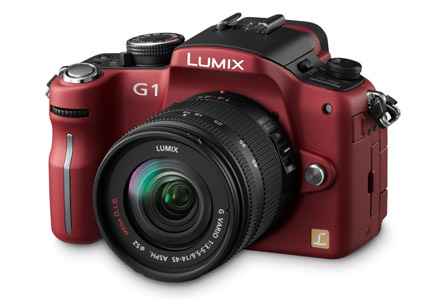 and really isn’t hyping any sensor technology advances with this one, while Panasonic’s 3rd-generation TZ4/TZ5 is a well-polished product at this point, so I wouldn’t expect this to be Samsung’s breakout camera that dominates the competition. Nonetheless, it’s an interesting option with a 24mm starting point, and my guess is that Panasonic will once again start pushing the envelope, especially now that 28mm wide-angle is somewhat standard/rapidly becoming so. This entry was posted on Monday, September 22nd, 2008 at 18:14	and is filed under Market Analysis. You can follow any responses to this entry through the RSS 2.0 feed. You can leave a response, or trackback from your own site.